Introduction: ln the not so vast panorama of adaptations into comics of medieval literature, Beowulf is clearly an exception. Whilst several comic books series and graphic novels are inspired by the world of Icelandic sagas, for example, very few of them can be considered as retellings of a specifics source text. Even in the case of the German Nibelungenlied, most graphic novel adaptations rework not the original medieval poem, but Richard Wagner’s free reworking of all the sources of the Nibelungen legend, thus, what we have before us are often retellings of a retelling. A very different case is the one of the Old English heroic poem describing the fights of the Geatish hero Beowulf against three powerful antagonists: the anthropomorphic monster Grendel and his mother – both killed by the young hero in the land of the Danes – and the fire-spitting dragon, which Beowulf kills in his old age with the help of the younger warrior Wiglaf. 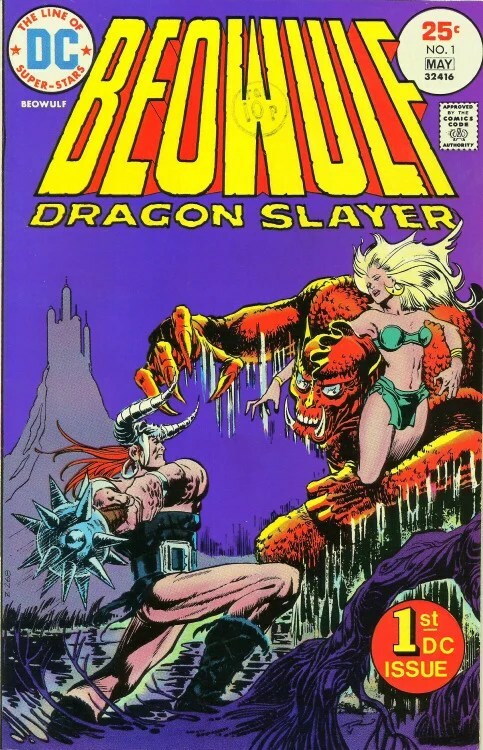 The first and very free adaptation of Beowulf into comics was by Enrico Basari and Kurt Caesar and it was published in the Italian comics magazine Il Vittorioso during the years 1940-1941. Since then, this Old English poem has been transposed into comics a surprisingly high number of times and, moreover, its popularity in the contemporary popular culture is demonstrated by the several transpositions into other semiotic codes, such as movies, TV series and music, not to mention science fiction and fantasy novels.